I grabbed a sample of L'Artisan Pastellier from Lisa Vanness when she visited Seattle last month. You can find the ink at Vanness Pens here. I'm not really sure when I would use this color, but let's take it for a spin. Olive is well, and olive color, with some shading. I had a heck of a time getting the color to display correctly. In the pictures and scans the ink looked a lot more gray than it did on paper. (I color correct everything in Lightroom). There is just a little bit of green sheen on the pooled ink. Other properties: Medium shading, Low sheen-I could only get the ink to seen in large swabs and in a flex nib on Tomoe River paper, I didn't see any sheen on the other papers. On 32 pound copy paper the ink behaved well, I didn't have any issues. 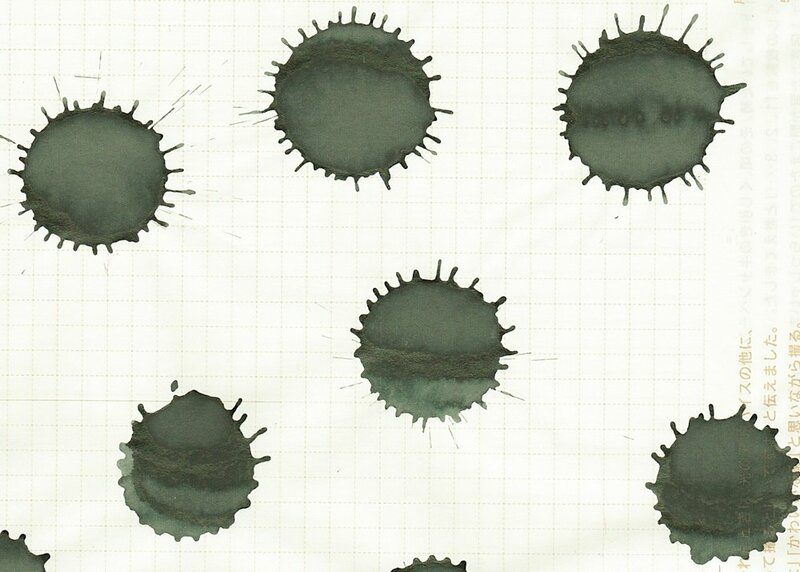 Ink swabs for comparison, left to right (top to bottom for RSS): Papier Plume Streetcar Green, L'Artisan Pasteller Olive, and Rohrer and Klinger Alt-Goldgrun. I think Streetcar Green is the closest green, but it does shift just a bit darker than Olive does. 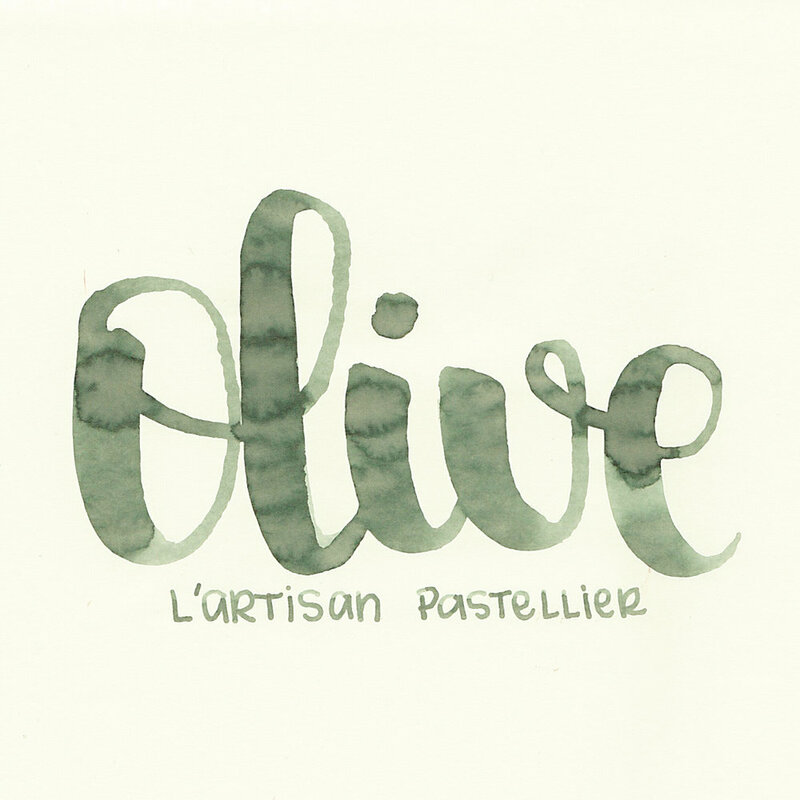 Click here to see the L'Artisan Pastellier inks together. Diamine Salamander, Sailor Jentle Epinard, and Sailor Jentle Miruai. Click here to see the green inks together. I used a Pelikan m800 Brown Renaissance, medium nib on Tomoe River paper. It had a nice smooth flow. Overall, the ink is well behaved, and I like the tiny pop of sheen in the flex nib, because the green sheen is really interesting. I don't think this ink is one I would use really often though, just because I tend to prefer brighter colored ink. Disclaimer: I was given a free sample of this ink. All photos and opinions are my own. There are no affiliate links on this page.